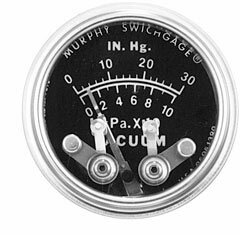 The 20 Series (2 inch/51 mm dial) and the 25 Series (2 1/2 inch/64 mm dial) Swichgage instruments are diaphragm-actuated, vacuum-indicating gages with built-in electrical switches. These switches are used for tripping alarms and/or shutdown devices. The 20 and 25 series gage mechanism is enclosed in a steel case coated to resist corrosion. A-Series gages have a polycarbonate case and are sealed from the environment. All gages feature a polycarbonate, break-resistant lens and a polished, stainless steel bezel to help protect these rugged, built-to-last instruments. The gage pointer acts as a pressure indicator and as one switch pole which completes a circuit when it touches the adjustable limit contact. Contacts have a self-cleaning motion to ensure electrical continuity. Gage-only models, without contacts (Murphygage® instruments) are also available. A pulsation dampener (PD2160) is included with each Swichgage to help eliminate pointer flutter. When monitoring intake manifold vacuum, the PD2160 is mounted in the manifold. The PD2160 has a 1/8-27 NPT connection. Commonly used to measure loading of spark-ignition engines through intake manifold vacuum, the gages also can serve as overspeed protection from sudden loss of load on these engines. Use anywhere the vacuum source is compatible with port materials. 2-SPST contacts; pilot- duty only, 2 A @ 30 VAC/DC. Contacts are gold flashed silver.